Analysts routinely face steep challenges as they attempt to integrate diverse enterprise-wide data. This statement is especially true when this data contains natural variability (for example, Bob versus Robert), unintentional errors (such as a transposed month and day in a date of birth) and professionally fabricated lies (such as a fake identity). Incorrect or incomplete integration can negatively affect any analytic solution that is built by using the data. By implementing Entity Analytics, analysts can overcome some of the toughest data preparation challenges with unprecedented ease. By using Entity Analytics, analysts can generate higher quality, more accurate analytic models that result in better business outcomes. This activity can be accomplished regardless of whether the goal is detecting and preempting risk or recognizing and responding to opportunity. 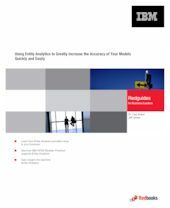 This IBM® Redguide™ publication explains how Entity Analytics can help analysts through the models that they create to drive better business outcomes. This guide provides an overview of the IBM SPSS® Modeler Premium product that incorporates Entity Analytics capabilities. It also provides examples of how Entity Analytics makes determinations and helps to solve business problems. In addition, this guide takes you through a lending scenario for a fictitious bank to illustrate usage of Entity Analytics.